GMP50/40 mortar pump is a piston type machine with single cylinder and single acting. It is widely used for its convenient maintenance, high working pressure and high efficiency, working reliability, compact structure etc. 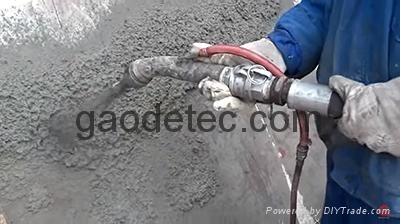 This cement mortar plastering machine not only can be used for grouting cement mortar and sand mortar. When it is combined with accessories such as compressor and spraying gun, this piston pump machine is also an ideal equipment for spraying. It can be widely used for grouting in mine gallery, rail and road tunnel, hydro power construction, slope consolidation, underground engineering, subway and civil engineering etc.